For three days from January 18th to 20th, Monterey, California, has become an aggregation hotspot for more than 100 of the world’s foremost experts on the conservation and management of the three bluefin tuna species that inhabit our global ocean. The Bluefin Futures Symposium represents the first-ever international gathering of leading science, policy, industry and conservation leaders to address the current stock status, research efforts and management uncertainties, topics which hold the key to ensuring the future sustainability of harvesting these ocean predators. The symposium was partitioned into 11 sessions throughout the three days; each of which had a specific focus: Day 1– the latest research on bluefin tunas; Day 2– science-based management of bluefin tunas; Day 3– emerging opportunities and challenges for bluefin tuna sustainability. Among the attendees, four members of the Nereus Program: Dr. Yoshitaka Ota (Policy Director of the Nereus Program – UBC), Dr. Wilf Swartz (Nereus Program Manager & Research Associate – UBC), Dr. Andre Boustany (Nereus Program alumnus – Duke) and me, Guillermo Ortuño Crespo (Ph.D. Student & Nereus Fellow – Duke). The presence of Nereus at the symposium was not unnoticed. 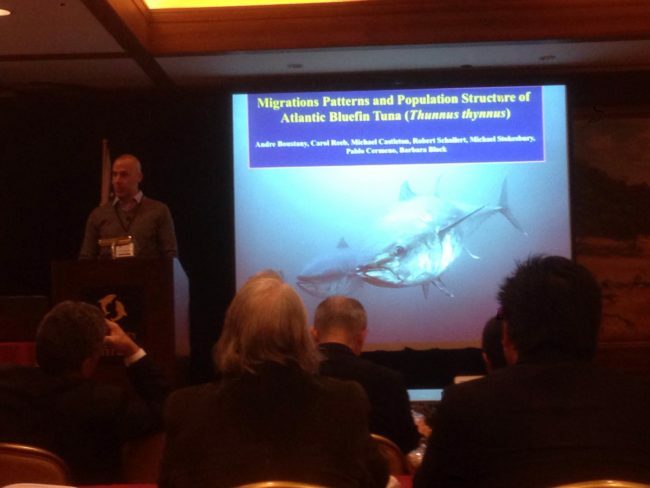 Dr. Boustany opened the first session of the three-day event with a synopsis of our knowledge on ‘Migration patterns and population structure of Atlantic bluefin tuna (Thunnus thynnus)’, which set the arena for extensive discussions on the spatial dynamics of the species. The event was also an opportunity for Dr. Ota to exchange impressions with Maria Damanaki (former European Union Commissioner for Maritime Affairs and Fisheries and Global Managing Director for Oceans, The Nature Conservancy) who shared the latest Nereus biannual report entitled “Predicting Future Oceans: Climate Change, Oceans & Fisheries”, via Twitter. Throughout the symposium, multiple references were made towards the need for further integrating fisheries economics and including NGOs in the management process of bluefin tuna; the interdisciplinary research conducted by Dr. Swartz and Dr. Lisa Dellmuth (Senior Nereus Research Fellow – Stockholm), among other Nereus members, lies at the heart of these questions and highlights the role that Nereus research could play in these and other regional management processes. The seventh session of the symposium: ‘Working toward sustainable bluefin tuna fisheries: RMFO solutions’, gave rise to the first series of forward-looking, achievable suggestions towards making tuna regional fisheries management organisations (RFMOs) more credible, inclusive and democratic. Market-based solutions to the illegal, unreported and unregulated fishing (IUU) of bluefin were discussed and included the implementation of additional traceability mechanisms and catch documentation; “take away market value of illegal fish, no documentation, no value” said Stefaan Depypere, Director of International Affairs and Markets, European Commission Directorate General for Maritime Affairs and Fisheries. 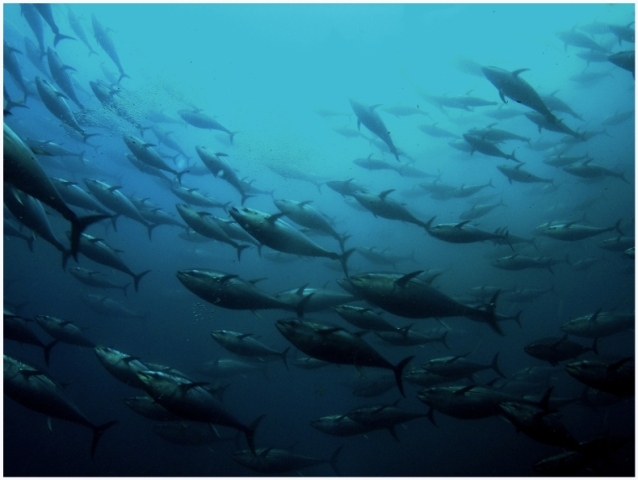 The International Commission for the Conservation of Atlantic Tunas (ICCAT) recently implemented the Bluefin Tuna Catch Documentation Scheme, which significantly improved the traceability of Atlantic bluefin tuna catch; other RFMOs could and should follow. The panel agreed that the inclusion of developing nations which harvest bluefin tuna should extend much beyond their participation in the data collection process, by making them part of the scientific data analysis stage and decision-making process. 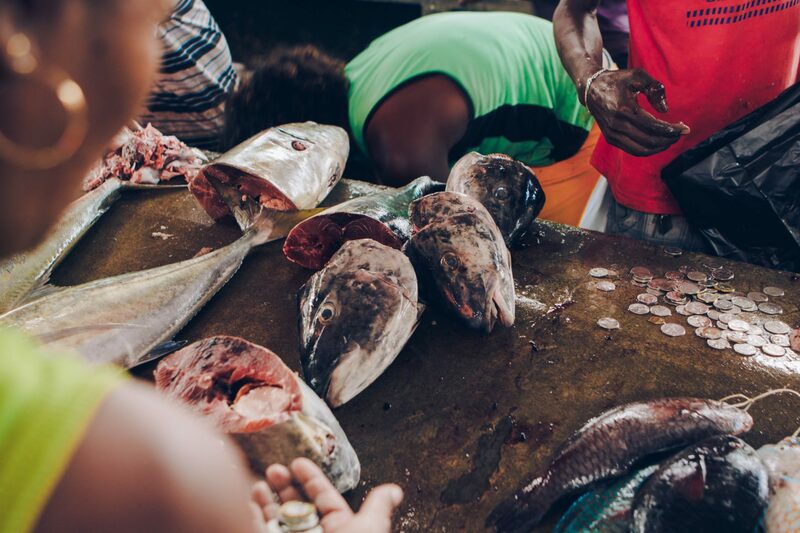 Panelists also agreed that the tuna RFMO decision-making is still a highly politicized process where compliance and transparency on data collection is not always achieved. Ensuring the equity in the responsibilities of data collection and compliance is an achievable milestone that should include all tuna-fishing nations, both developed and developing; this would not only improve the information that feeds the management process but also provide tuna RFMOs with more credibility and trust between member states. The Bluefin Futures Symposium had managers, scientists and NGO representatives sitting around the same table to not only discuss problems, but feasible solutions, to the future sustainability of bluefin tunas. Image: "Bluefin tuna" by Aziz SALTIK, CC BY-NC-ND 2.0. This session reflected the constructive character of the symposium, where managers, scientists and NGO representatives were able to sit around the same table to not only discuss problems, but feasible solutions. While there is still a very clear influence of governments in the decision-making process of bluefin tuna management, new challenges will inevitably require investigators whose work lies at the interface between science and policy and who are capacitated to address the complexities derived from problems such as climate change within the adequate management frameworks. In fulfilling its mission, the Nereus program continues to equip its fellows with the necessary means to carry out this interdisciplinary work and thus stay at the forefront of many of the marine conservation challenges we face nowadays. Andre Boustany, Nereus Program alumnus (Duke), presents Nereus research on ‘Migration patterns and population structure of Atlantic bluefin tuna (Thunnus thynnus)' at the Bluefin Futures Symposium.